Fair.healthdata.be was launched on July 7, 2017. This first release (0.1) contained 27,241 records from 2 catalogs: the inventory “AP18” of the Action Plan eHealth 2013-2018 (252 records), and an extract of the European Union Clinical Trials Register (26989 records). 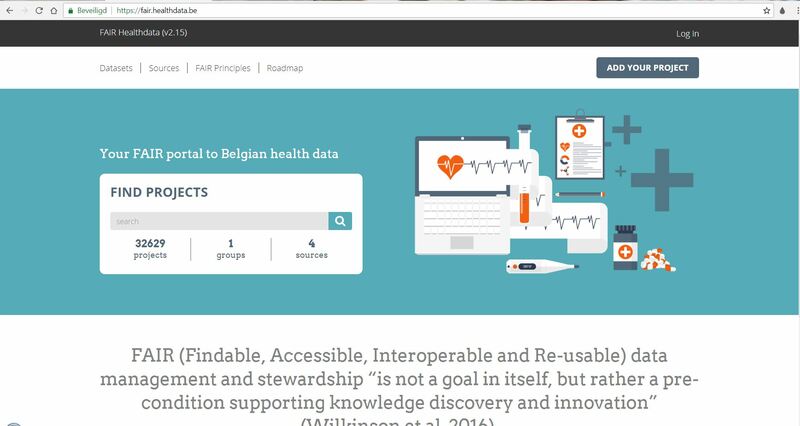 It is the ambition to continuously add catalogs, projects and resources, related to Belgian health and health care, to this platform, and to develop taxonomies connecting all these projects and resources. During the Open Summer of Code (an event of Open Knowledge Belgium) 6 students will work for the “data for better health initiative” and will build further on the FAIR portal and add a lot of visual data stories! Follow them on twitter using #oSoc18. Public data belonging to the federal government must be accessible, with a few exceptions based on privacy and security. Transparent access to data means a better democratic process. That is why the federal government started with a roadmap of actions to ensure that this data becomes accessible in a user-friendly manner using an open data portal. The federal open data strategy includes an ambitious view on open data and several concrete action points by 2020. A bill that supports this strategy and regulates the reuse of government information. The law is at the same time the transposition of the 2013 European PSI Directive, an important part of the European Open Data Strategy and Digital Agenda.